When you follow your dreams you are going to find that you’ve all of a sudden become a very different person. You will be motivated to make every day count towards seeing your dream come true. And in so doing you will develop skills and accomplish things you never thought possible. Following your aspirations that God put in your heart is a good thing. God wants you to succeed and be a blessing to other people around you. The fulfillment of pursuing your dreams can make you a stronger person, and motivate others to purse their own dreams. Life is about continually helping each other become a better person. It is about encouraging and supporting others to accomplish those good things in life. In my story, Isabella’s Lollipop Dreams, the lollipop quickly becomes the catalyst for Isabella’s imaginative dreams. 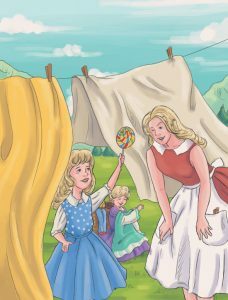 Taken by her daughter’s sentiments, Isabella’s mother uses the opportunity to bond together with her two daughters, while taking down the clothes from the clothesline. Eventually, after a beautiful day of enjoying being together, Isabella wants to make sure that her mother knows that dreams really do come true. True, we can all become discouraged from time to time, as no doubt there will be obstacles to overcome along our journey, but those words, “dreams do come true,” spoken by Isabella after she prayed, was just what her mother needed to hear. So believe in your own dreams, and in the dreams of others. By doing so you will create bonds of hope for yourself and others that can’t be broken.